Compeat is a restaurant management tool that offers total back-office back office solutions. The software puts in one place all the tools food businesses need, such as inventory and price checks, accounting, workforce management and more, for a better streamlined operation. 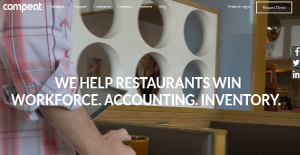 Compeat offers a solution that assists restaurants in handling their accounting and inventory needs. Through this, the food business’s financial records are kept up-to-date and the inventory well-stocked. Furthermore, Compeat also provides standalone applications to cater to specific needs. If a restaurant only requires the addition of a workforce management tool, they can acquire that and integrate it with their existing Compeat system. And that is the beauty of this software. Compeat’s in-house solutions are within grasp when a restaurant feels the need to add them to their system. In addition, they do not have to run separately—rather, they are all accessible and can be run from one user-friendly interface. Through Compeat Accounting, restaurants can be sure their finances remain in the black. This solution gives them total control of their bottom line with tools that are specifically made for restaurant management. With it, they can decrease spending and losses and maintain their budgets by comparing ideal vs. actual costs. It also has tight security, so that all users and changes are logged and if discrepancies occur, they can be easily traced. Inventory keeping has never been easier with compete. This function is integrated with Accounting, thus restaurants can effortlessly reconcile their orders with their bookkeeping. Further, food businesses can whip a new menu item and change their food offerings within the Inventory solution. This saves time by eliminating the need for a recipe and menu keeper. Compeat’s labor tool gathers all employee data in one accessible interface, so that auditors, managers, and owners can pull them up with no difficulty. With this tool, they can calculate how much they are spending on their staff. In addition, the app aids them in keeping with different labor laws to make sure they do not break any regulations. And when it comes to payroll, the system pulls up data from logs for a more accurate calculation of workers’ wages. Compeat Payroll also covers the necessary filing of federal documentation such as W-2 and SUI/SUTA. Meanwhile, the system’s scheduling function makes creating schedules faster. With Compeat, employee-manager communication is streamlined because of an online portal. This lets employees check their schedules and logs for their own time management. And if they have shift swap or leave requests, they can also input those in the portal. And once managers or supervisors are notified, they can immediately act on those. Restaurants can cast their net wider when looking for great potential employees with Compeat Hire. The talent management tool links hiring notices to social media, including LinkedIn, and to Indeed. Those job posts have dedicated URL, too, so talent managers can share it to other platforms. All the information needed or wanted in one place, anytime and anywhere. Compeat Intelligence is a customizable dashboard that displays overviews of different aspects of the restaurant’s operation. With it, food businesses can easily identify trends and inform other branches about it. In addition, it pinpoints which areas generates most of the revenue and which areas are costing the restaurant. Through this interactive dashboard, restaurants can make informed decisions and grow their business with the help of insights and reports. If you are considering Compeat it might also be sensible to analyze other subcategories of Best Restaurant Management Software collected in our database of SaaS software reviews. Each enterprise has different needs and requires an application that can be personalized for their size, type of employees and customers, and the particular industry they are in. For these reasons, no platform can offer perfect functionality out-of-the-box. When you try to find a software app, first be sure what you need it for. Read some Compeat reviews and ask yourself do you need basic functionality or do you want complex functionality? Are there any industry-specific functionalities that you are searching for? Obtain the answers to these questions to help your search. There are lots of factors that you need to mull over and these include your finances, specific business requirements, your organization size, integration needs etc. Take your time, try out a few free trials, and finally choose the system that provides all that you require to boost your organization efficiency and productivity. How Much Does Compeat Cost? We realize that when you make a decision to buy Restaurant Management Software it’s important not only to see how experts evaluate it in their reviews, but also to find out if the real people and companies that buy it are actually satisfied with the product. That’s why we’ve created our behavior-based Customer Satisfaction Algorithm™ that gathers customer reviews, comments and Compeat reviews across a wide range of social media sites. The data is then presented in an easy to digest form showing how many people had positive and negative experience with Compeat. With that information at hand you should be equipped to make an informed buying decision that you won’t regret. What are Compeat pricing details? What integrations are available for Compeat?